Enjoy weapons, armor, food and objects of various animes, in Minecraft. 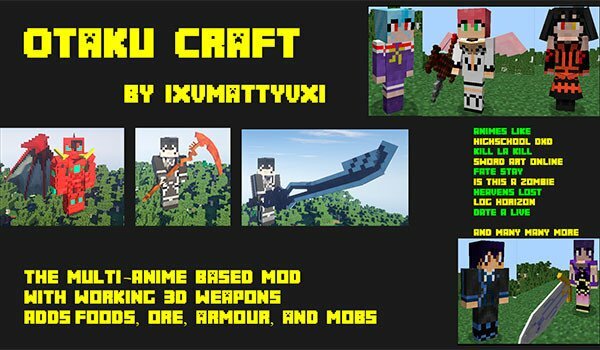 Otaku Craft 1.7.2 and 1.7.10 is a mod based on various types of cartoons, including Sword Art Online, Highschool DxD, Is this a zombie, Heavens Lost Property and many others. So this mod adds diverse content such weapons, armor (that simulate clothing of some characters of these cartoons), food items, new minerals, and other objects. Some of the weapons that adds this mod are in three dimensions, but not all, because in reality the number is quite large. Although the author aims to go modeling all those weapons have not yet raised. How to install Otaku Craft Mod for Minecraft 1.7.2 and 1.7.10? You can start new adventures with the kit and objects of various anime!